In January we’ve had our pick of restaurants as no one was dining out due to overspending and over-eating at Christmas. It was therefore inevitable that when, on the first post pay day Saturday, we wished to eat in The Mailbox’s refurbished “Oriental” we were unable to get a table. We returned to Bar Epernay where we’d earlier been drinking Peroni and listening to the pianist, and bagged almost the last table available for dinner. Recently some of our acquaintances have suggested that they’ve not enjoyed dining here so it was about time we came back to check on it anyway. Back in the day, when The Mailbox was new and shiny and Birmingham was being refurbished from the ground up, Bar Epernay was quite swanky, certainly the only Champagne bar in Brum that I knew of. Despite the passage of some 10 years it still feels luxe. The furniture is heavy and the decor neutral but inviting. The round open fire is super cosy in winter and the addition of a pianist rather than generic piped pop is welcome to those of us that want to have a conversation over dinner rather than shouting to make ourselves heard. Although it’s a Champagne bar they do have a very large range of wine, beer, lager, and cocktails on offer too. 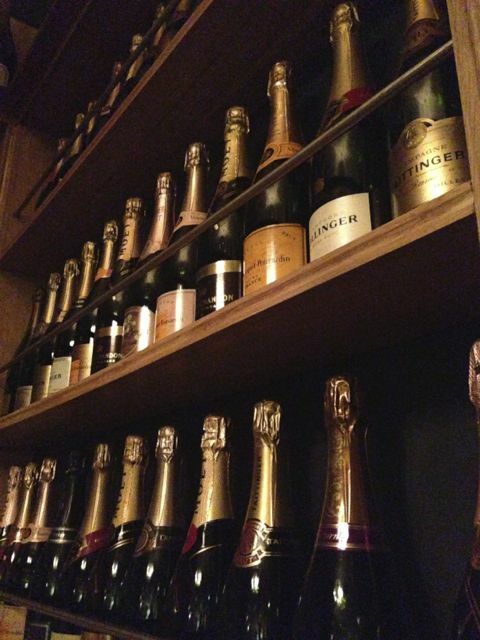 If you’re around on a Friday evening then you should partake in “Friday Fizz”, that’s house champers for £20 a bottle. When on the cocktails I particularly enjoy the Espresso Martini or if it’s getting late then the decaf version which tastes just as good, the Monkey Manhattan is punchy and worth a go if you like a stronger cocktail as I do. Or alternatively there are plenty of sweeter offerings and Champagne cocktails such as the passion fruit Mojito. We were seated in the more private area at the back of the restaurant, I think it used to be reserved for Champagne. I had something of a cheese-fest starting with a Baked Camembert followed by the Goat’s Cheese and Caramelised Red Onion tart. The Camembert was big enough for two to share as a starter, served with rustic bread, and roasted cloves of sweet garlic. My main was also substantial with the cheese to onion ratio about perfect. Three small tarts were served on a salad of leaves and beans which was nicely dressed. 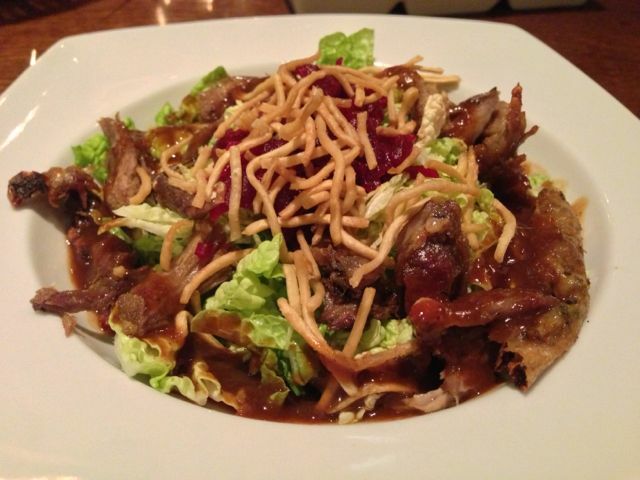 The special starter of lamb skewer wasn’t up to much, but we did really enjoy the duck salad. As mains we also had steak, a whole lemon sole, and mussels in a tasty white wine and coriander sauce. The service was at about the right speed, not too rushed, not too slow. On another visit here we ate a beef Sunday lunch, and Fish and Chips. I thought the Fish and Chips was delicious and a perfect hangover cure on a Sunday lunch time. Two courses will set you back about £20 per head, and wine starts from about £15, with many wines and Champagnes available by the glass. The website lists the offers that are available at the moment including £15 two course Sunday Lunch, or if you have some cash to splash then try a very limited edition James Bond themed Bollinger Champagne (La Grande Année 2002) presented in an exclusive ‘gun-barrel’ case at £125. So in summary I’m pleased to report I think the food here is still as good as ever. It’s also a great place to go for an adult dinner out, for cocktails, Champers, or just a Saturday afternoon beer and a catch up with friends. 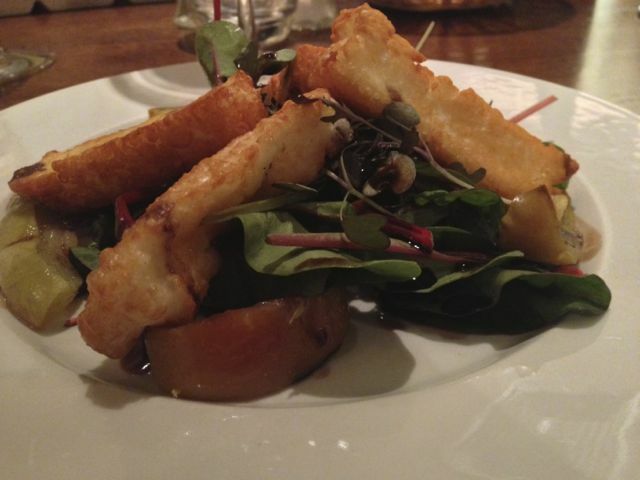 This entry was posted in Area: The Mailbox, Cuisine: Modern Mixed, Price: Cheap as Chips - Inexpensive, Price: Get your dad to pay - above average, Venue type: Bar, Venue type: Cocktail Bar, Venue type: Restaurant, Venue type: Wine Bar and tagged birmingham cocktails, Birmingham Restaurant, birmingham restaurant review, birmingham review, birmingham sunday lunch, Epernay Mail Box Review, out in brum, OutInBrum, restaurant review, Where To Go In Birmingham. Bookmark the permalink.